October 03, 2018, 11:20 a.m. In recent days, an inquest heard about the tragic case of Natasha Ednan-Laperouse, a 15-year-old who died after suffering an allergic reaction to a Pret a Manger sandwich while on board a flight to Nice. Her death came after she ate a baguette containing sesame seeds – an allergen not listed on the wrapper – and her family are campaigning for a change in food labelling laws. Pret a Manger said it was "deeply saddened" by her death. The inquest attracted a great deal of media attention and YouGov brand tracking data suggests that public perception of Pret has worsened in the aftermath of the case. 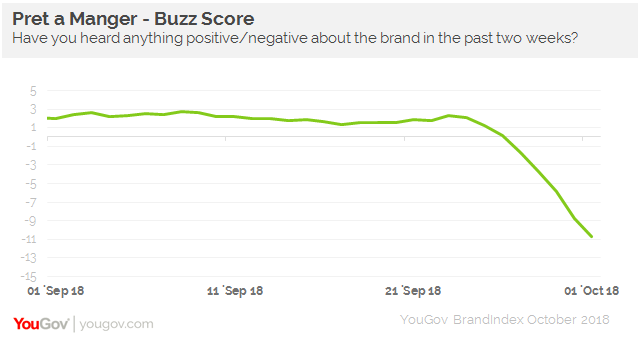 Its Buzz score (whether someone has heard something about the brand, and if so, if that was positive or negative) declined sharply from +2 to -11 over the past week or so. In all the time we have tracked Pret, this is the first time its Buzz score has been negative. Up until this week, it had performed well on this metric compared to its competitors. Similarly, Pret’s Word of Mouth Exposure score (which measures whether people are talking about a brand with friends or family) has risen significantly, moving from 3% to 8%. The knock-on impact of this is that its Impression score (whether someone has a positive or negative impression a brand) among the general public has also declined. On this metric, Pret’s score has dropped from +18 to +9 during the same time period. So while the public does still have a good impression of the brand, this score is moving in the wrong direction. However, while its Impression score has also dropped among current Pret customers (from +80 to +75), its rating still remains pretty high overall. 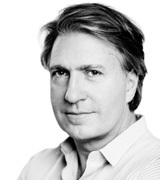 In all likelihood, its customer base will continue to visit its outlets. In the short-term, Pret has work to do in order to convince the wider public that it has rectified issues around its labelling brought to light by this dreadful case.